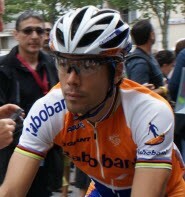 Rabobank’s Spanish sprinter Oscar Freire has been the latest rider to confirm his non-participation in the Giro d’Italia, which starts in Amsterdam on Saturday. The three-time World champion has been plagued by sinusitis since last month’s Amstal Gold Race and has finally given in to the condition and withdrawn. His place in the team will be taken by 22-year-old Steven Kruijswijk in his first ever Grand Tour. Freire is the second Rabobank rider to be withdrawn from the Giro d’Italia team after Koos Moerenhout pulled out earlier in the week. His absence also further reduces the number of top sprinters at the race, after Liquigas-Doimo’s Daniele Bennati dropped out on Tuesday. Although Rabobank was confident that Freire would pick up at least one stage win in what would have been his first ever Giro, the Dutch team can fall back on Australian fastman Graeme Brown. Mauricio Ardila, Graeme Brown, Rick Flens, Dmitry Kozontchuk, Steven Kruijswijk, Bauke Mollema, Tom Stamsnijder, Jos Van Emden and Pieter Weening.